Organizing Director, Manisha Vaze, presenting findings at a convening held earlier this year. Over our history, SCOPE has built workforce training pipelines into growing industries or sectors, including film, in-home care, and energy efficiency and green jobs. While expanding access to oral health care has been a part of SCOPE’s health and wellness work, it has not yet been a part of our workforce campaigns. When SCOPE decided to partner with the DentaQuest Foundation to explore the potential for a new workforce pipeline in the oral health care industry, we realized we didn’t know much about South LA residents’ general attitudes and experiences with the current oral health landscape. 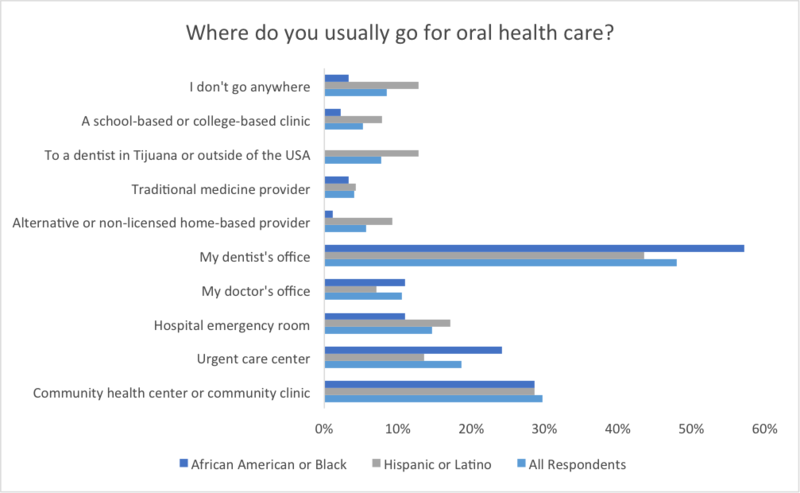 How often did residents access oral health care resources? What was the quality of services? What were some of the barriers to access? These are some of the questions we asked to help us understand the landscape and how to build power for both workforce pipelines and health and wellness for South LA. SCOPE’s Health and Wellness Work in Oral Healthcare – In 2013, SCOPE members, along with our partners at the California Partnership’s Health Policy Coalition, advocated for the restoration of much-needed services in California’s Medicaid-funded dental benefits program. During the Great Recession, the Governor had slashed the Medi-Cal budget for the dental insurance benefit, leaving millions of Californians with no option but to wait until their oral health needs became a medical emergency before accessing services through their public dental insurance program. One SCOPE member, Lynette, shared her story of the horrifying impact that the lack of oral health care had on her with legislators: Lynette desperately needed a root canal, but due to lack of funds for non-emergency care, was forced to wait until the pain in her mouth was unbearable as the infection became an abscess and began to affect other aspects of her health when it infected her blood. Understanding the Landscape Today – Since the Great Recession, some of the services to Medi-Cal and Medicare have been restored – But are the services enough to meet the needs of Californians who are dependent on these programs for their oral health care? This was the central question SCOPE hoped to understand when partnering with the DentaQuest Foundation in 2015. Our goal was to engage community-based organizations, residents, and health service providers to learn about their perception of oral health education, access, and care in South LA. We aimed to share these findings with various stakeholders and to convene a space to develop a multi-year strategy to change the oral health care system in the long term. In order to answer the central question, we used three strategies to collect data: (1) facilitated an oral health landscape assessment using SCOPE’s Power Analysis tool with key stakeholders, including social justice organizations, health justice organizations, and health service providers; (2) conducted a series of listening sessions with adults to collect stories and learn from South LA residents about their experiences, access to and perceptions of oral health; and (3) surveyed adult residents door-to-door and in other gathering places about their oral healthcare experiences, accessibility, and perceptions. Results from Community and Service Provider Engagement – The Power Analysis, developed with the input from community organizations and service providers, informed SCOPE’s analysis about the main problems and conditions providers and South LA residents face in our community. It also led to an understanding of the groups involved in the provision of and advocacy for oral health care services. Finally, it drew attention to the decision-makers who have the power to change the oral health landscape. This initial discussion gave us a set of themes to discuss with South LA residents during the listening sessions and through the surveys. During the listening sessions, we found that most participants felt that oral health care is a high priority in their lives and many take their children to the dentist every 6 months even if they themselves do not always access services due to the high costs. Participants shared that a barrier to accessing oral health care services is often the fear of dentists that is related to a traumatic or otherwise scary experience from childhood. Older participants pointed to a gap in care between retirement and reaching the age where they can enroll in Medicare, making them unable to access care unless it becomes a medical emergency. While participants said oral health care is important, it wasn’t on their priority list given everything else they pay for: rent, school supplies, clothes for their family, transportation expenses, and food. Some participants described feeling mistreated and overcharged for services by dentists who recommended treatments that were outside of their insurance coverage. Furthermore, many described going to Mexico or “clandestine” clinics in Los Angeles for services because, according to them, these options offered better cleaning and services at a cheaper cost and a shorter wait time. To round out our data-collection design, SCOPE collected 246 surveys from South LA residents. Findings confirmed what we heard in the listening sessions: South LA residents are informed about the overall health benefits of keeping up with oral health, but the financial barriers to accessing care keep people away. Some of our survey respondents also said they go to Tijuana, Mexico, or to a “clandestine” clinic in Los Angeles to access needed services. Others wait until they can access emergency services, at the cost of putting up with unbearable pain. 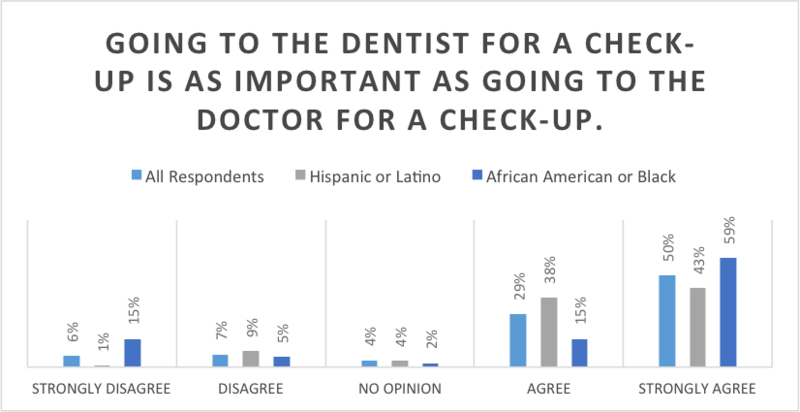 Close to 75% of African Americans and 80% of Latinos agreed or strongly agreed that going to the dentist for a check-up is as important as going to the doctor for a check-up. 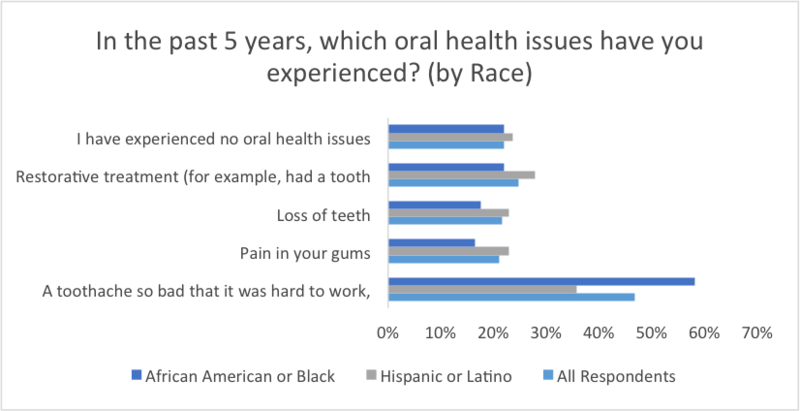 Almost all Latino respondents (91%) and a majority of African American respondents (79%) agreed or strongly agreed that oral health is an important component of overall health. The majority of respondents valued oral health preventative services, meaning they do not want to wait until a medical emergency arises in order to seek care. Unfortunately, although prevention was important to most people SCOPE surveyed, most respondents reported that they have recently experienced a toothache so bad that it interferes with their daily lives. 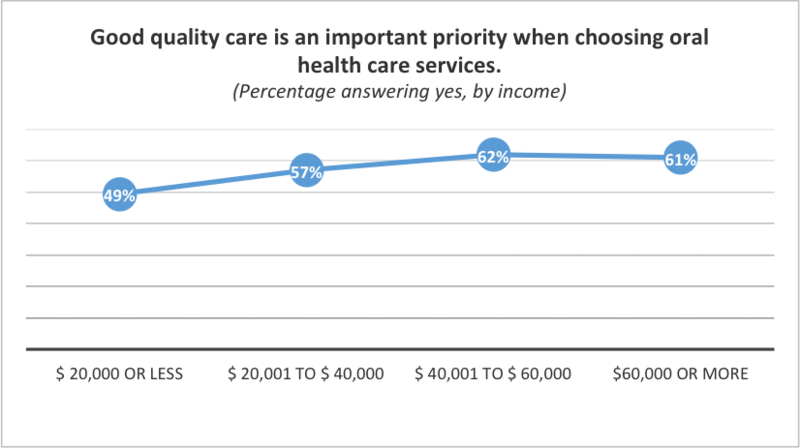 Amongst survey respondents the highest priority when choosing an oral health service provider is the provision of quality care. As income goes up, this becomes a priority for more and more respondents. For residents of South LA, who are already financially burdened and whose healthcare access has been limited by defunding of state insurance programs, distrust of service providers and lack of a centralized and reliable source of information on the quality or pricing of services creates additional barriers to implementing preventative practices in their lives. The key takeaway from our work with the DentaQuest Foundation is that many South LA residents already understand the importance of oral health care, however, major barriers to accessing care exist and are related to a lack of access to employment and economic opportunity. Barriers to reaching quality services included transportation, lack of trust related to the quality of services, and a lack of funds to pay for services. Additionally, community members described needing more information about free or low-cost community-based services and insurance options in South LA. Lack of knowledge about available resources was a significant barrier, leading SCOPE to believe that models such as the community health worker or “promotores” model could bridge the knowledge gap. In addition to increasing awareness about services, investment in a community health worker model has the potential to create a new jobs pipeline for community residents in South LA. Advocate for increased public investment into oral health services, specifically through community clinics and related community-based services. Most respondents, regardless of age, trusted community clinics as a primary oral health provider because of the other services they already receive from these clinics. Develop a strategy to influence the oral health industry to break down barriers to care that are resulting from race, class, and perception of the South LA community. Community residents didn’t often trust dentists, feeling that they are manipulating the insurance companies and recommending services that are not covered to net profits. Some community members also described feeling mistreated in general. Develop a system to rate “quality care” provided by dentists. Community members felt that there were a lot of dentists available in their neighborhood but did not know if they provide quality care. A statewide rating system could empower local residents to trust local providers and incentivize these providers to provide good, quality care. Create opportunities for workforce development by formalizing a community health worker model and preventive services therapist model into the dental system. To aid in building the trust of providers and other industry representatives, community members need to see familiar faces and to see themselves in the service provision roles. Continue to build power in South LA to educate policymakers, service providers and dentists about public health so they have the tools and skills to meet the needs of the communities they serve. The data we collected indicates that the main barrier to oral health care access is not lack of education about the importance of oral health, rather it is that the policies, programs, and providers and not equipped to meet the needs of the communities they serve. Cuts to preventative care budgets, though good for the state, put resident at greater health risks by forcing them to wait until they need emergency services in order to seek care. Childhood and other negative experiences with service providers and dentists push community members away and lead to increased distrust in the oral health industry, which decreases the likelihood of their seeking and finding quality services. SCOPE is excited to continue to learn about attitudes and perceptions amongst residents of South LA this year. Our community has a lot to gain through better access and the potential for jobs in this industry.